This Monday, I will introduce a proposition, P-19-2, to change the City Charter to increase the number of Council districts from the current nine to eleven. If approved by the City Council, the proposition would go before the voters to decide in the November 5 municipal election. In 1974, with Albuquerque’s population at approximately 260,000, our city government was changed to a Mayor/Council form of government, with an elected chief executive (mayor) and a legislative branch made up of nine city council persons. Today, our population has more than doubled to 585,000 people. In 2005 when I first served, the office of Councilor was commonly described as a “part-time job.” I continued to work in my “regular job” at my small architecture firm. As time went on, I realized that serving effectively and responsively entailed much more than what most people would consider part-time work. After redistricting following the 2010 Census, my Council work became much more complex. Over the objections of residents, the two council districts covering the City’s center and North Valley were packed into the largest and most diverse district in Albuquerque. Today’s District 2 contains almost all of the city’s Pocket of Poverty neighborhoods, most of its designated Redevelopment Areas, its Downtown, Old Town, and the much more historically-rural North Valley. In “census-speak,” these are considered unique “communities of interest” deserving of particular representation. The redistricting process raised many concerns regarding dilution of voting strength, particularly among minorities. Eventually, I phased out my architecture work and dedicated my efforts to representing my district. Constituent and neighborhood inquiries, requests, and complaints to my office have continued to increase. Our district’s one dedicated policy analyst and I now work more than full-time to keep up with the needs of the district, but it’s still not enough. My office strives daily to meet needs that result from historic disinvestment in minority neighborhoods. Several other Councilors have the same challenges; like our district, other districts include residents and neighborhoods that feel they do not receive adequate, equitable attention. Concerns are often expressed about the equity of city services in some of the unique, old, and disadvantaged neighborhoods throughout Albuquerque with the oldest and poorest infrastructure. The last redistricting put the population of Council District 2 at over 60,000 persons. District 2 includes over 50 registered neighborhood associations. In New Mexico House districts, the average population represented is 25,600, with six districts overlapping District 2. In state Senate districts, average population is 49,000 and four districts overlap District 2. The House and Senate meet one to two months per year on important state and community matters. The City Council meets eleven months a year and ongoing needs within the City of Albuquerque require prompt attention 365 days a year. My proposal would bring us in line with similarly-sized cities. In U.S. cities of comparable population to ours, the average population per city council representative is approximately 52,986. In Albuquerque today, this would equate to eleven districts. While District 2 is currently the most populous district, all Albuquerque citizens would benefit from smaller districts. O-19-48 Limiting the Use of Single-Use Plastics and Polystyrene (Benton, Davis, Gibson, Borrego) is on the agenda for Monday's Council meeting. Click here for a fact sheet on the proposed ordinance. R-19-120 Programming the Capital Budget (Jones, by request) was passed at the last Council meeting. This two-year budget includes $14 million for an emergency homeless shelter and triage center, $5 million for the Rail Yards, $4.5 million for affordable housing, an additional $200,000 to complete funding for the 12th & Menaul intersection, $3 million for library materials, $170,000 for the South Broadway Cultural Center, $200,000 for the KiMo Theatre, $3.8 million for energy conservation, and $4.25 million for the new Broadway pump station, which we are building in collaboration with AMAFCA. The GO Bonds will be on the ballot this November. O-19-54 Ranked Choice Voting (Benton, Davis, Winter) was deferred at its first hearing at the Finance & Government Operations (FGO) committee and will be on the FGO agenda on May 13. This ordinance would establish a ranked-choice voting system for municipal elections, eliminating the need for run-off elections. Santa Fe enacted a similar process, which was used successfully in their last election. Post-Legislative Session Town Hall: Hosted by Senator Jerry Ortiz y Pino on April 13 from 1 - 3 pm at the Main Library auditorium. History of Barelas Photos Exhibit: Barelas Senior Center thru April 27. The Art of the Santero Exhibit: Historic First Methodist Church thru May 15. This week, joined by the family of Theresa Lucero, I dedicated a memorial at the intersection of 4th Street and Marquette Avenue her honor. 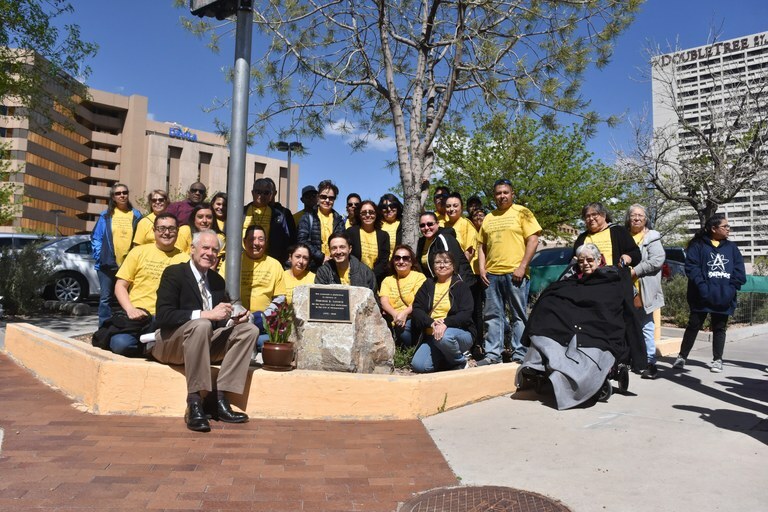 A dedicated City of Albuquerque employee for 28 years, Ms. Lucero suggested the diagonal crosswalk at the intersection leading to Civic Plaza. Diagonal crosswalks are a simple way to make cities more walkable and pedestrian-friendly. Theresa Lucero was ahead of her time, and I appreciate the family wanting to memorialize her and recognize her contribution. Downtown Public Safety Substation Food Drive: Please help by dropping non-perishable food items at APD Downtown Public Safety Substation at 100 1st Street SW in the Alvarado Transportation Center, M-F from 8am to 4pm.